If you don’t have a car in Melbourne, living within walking distance of transport can be pretty crucial. But how much would it cost to rent a room close to a train station? Thankfully, the team at Flatmates.com.au have answered the question with an interactive train map to help sharers reliant on public transport find rooms within budget and reach of the city. The map— styled off the familiar train network map— displays the average private room rental for each station in Melbourne based on a 1km radius. Chief executive officer of Flatmates.com.au, Thomas Clement, said the maps were designed to help those looking for an affordable place close to transport connections. “The maps also make it easier for sharers to identify where they can save money, for example a room near North Melbourne station is around $50 per week cheaper than one near Southern Cross”. Of the stations within 10km of the city centre, Essendon was the cheapest to rent a room near with an average room rent of just $172 per week. Thornbury and Spotswood stations rounded out the cheapest three with average room rents of $178 and $200 per week, respectively. 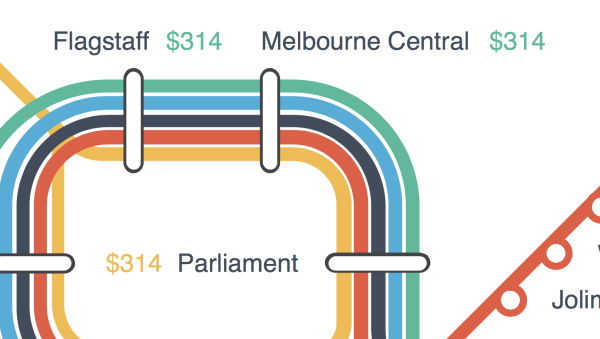 Overall, renting a room near Southern Cross Station was by far the most expensive in Melbourne with an average of $326 per week, while the cheapest was Somerville Station at just $120 per week.